Martyn has had a beard for going on 3 years now and it's taken at least 2 of those years to get him interested in maintaining his beard. I love a good beard as much as the next girl but if you don't look after it, groom it and treat it correctly, well, it can end up looking quite scruffy, to say the least! Thankfully, now that he has stuck his toes into the world of beard grooming products, he's much happier to try new products and give different formulas and brands a try. I'm still trying to get him into the routine where he uses all of his products every single day, but we'll get there eventually! 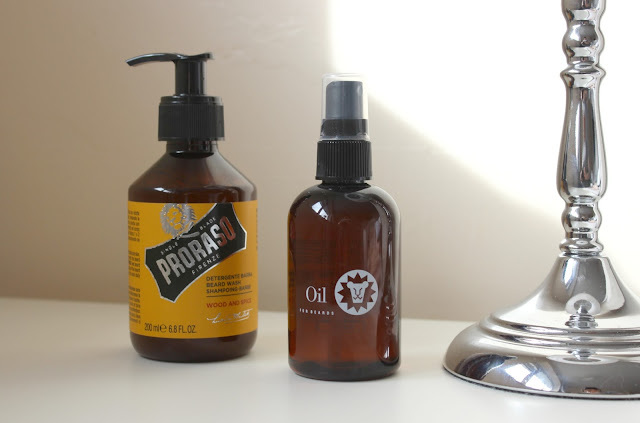 He's recently started using the Proraso Beard Wash, which comes in a 200ml bottle with a nifty pump making it super easy for him to use in the shower. The scent has a slightly warming masculine feel to it with woody and spicy tones, however much more subtle than a lot of male grooming products and actually really rather lovely. Made in Italy, it has a gentle formula that works to effectively cleanse both facial hair and skin, whilst helping to remove dirt and impurities all whilst adding a touch of softness to facial hair, sort of like a shampoo and conditioner in one! It has a very light foam when worked in, which I think is a plus for someone with facial hair as the last thing you want is a product which doesn't distribute evenly and easily. Price wise it's incredibly budget-friendly coming in at just £12.50 (with free delivery no less! ), which is great considering most beard grooming products Martyn has looked into have been £20 and upwards in price. There are a couple of products for beards in the Proraso range, so it's definitely a brand we'll be looking into again when he's ready to add a new product into his routine! Of course, there's more to beard maintenance then giving it a good wash and once product he is really enjoying adding into his daily 'routine' is the Beardsley Oil for Beards which comes in an 118ml bottle with a spray applicator. Any sort of oil product usually has a very high price tag attached to it but I think £21.95 is pretty reasonable for 118ml of a product; especially when teamed with the spray applicator which will ensure all the product is efficiently used and no worries over pouring or pumping out too much product. It has a non-greasy formula, which considering the usage is extra important as you don't want to go to all the fuss of cleaning and grooming to be left with a greasy beard! It helps to soothe skin, which can often be irritated by hair growth, whilst also conditioning facial hair and leaving it softer to the touch. The instructions for usage state 2-3 sprays of the product, which Martyn has found to be enough for his beard. After using these products for going on two weeks now and he's really enjoyed using them. Overall his beard is starting to look better, healthier, day by day and he finds the products quick and easy to use which is always a must when it comes to male grooming! You can find the full Proraso and Beardsley ranges, alongside beard grooming products ranging in price from £3.49 to £200.95, over on www.mankind.co.uk.